A terrorist who attempted to stab police in the Old City has been neutralized. Arab reported killed on Gaza border. An Arab terrorist tried to stab a policeman on Sha'ar Hagay Street near the Shechem Gate in Jerusalem's Old City Friday. The terrorist was neutralized and arrested by police forces on the spot. A Magen David Adom team treated two women for emotional trauma. 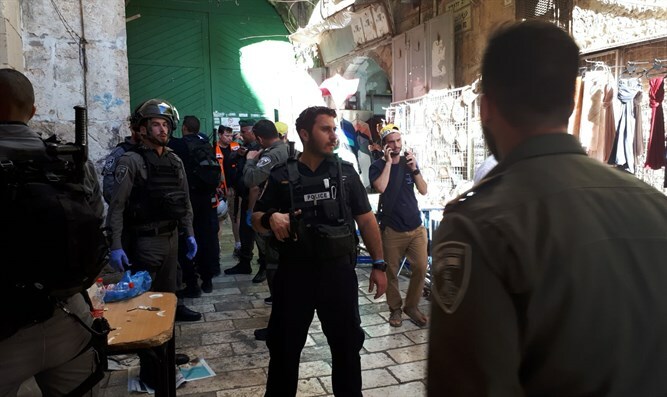 "A short time ago," said the Israel Police, "a suspect man approached a police position in the Old City and apparently tried to stab one of the policemen. The terrorist was neutralized." On the southern front, Arab media reported that one Arab was killed in clashes with the IDF along the Gaza border Friday, and 30 wounded. Five of these were reportedly wounded as a result of IDF sniper fire. Meanwhile, large firefighting forces battled three fires that broke out at Be'eri Forest in southern Israel, as a result of the launching of incendiary kites by Gaza terrorists.